Maryann, is the mistaken name that the White Rabbit calls Alice in Alice's Adventures in Wonderland. But who is she. This novel explores the character of Mary Ann, as she is left in the wake of Alice's destruction. 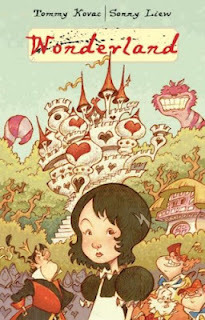 We meet some new characters and of course revisit the old ones as Mary Ann makes her way through Wonderland. 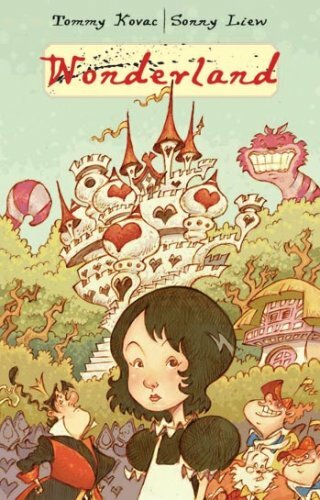 A very interesting take on the whole Adventures in Wonderland story. We get to travel through Wonderland with Mary Ann, the White Rabbit's maid. She's a clean freak and carries around a bird-like feather duster with her everywhere (it talks). I really liked to sneak into Wonderland after all the chaos that Alice mixed up and see how everyone was. Queen of hearts was still crazy bloodthirsty, Tweedle Dee and Dum were still dumb. It was great getting to see new characters too. This really was not a retelling at all. It was a mostly different story set in the same world. I love the illustrations, they are so colorful and full of life. This was originally published as four separate comics, but was bound in the hardcover format that I read and loved. If you are a fan of the original, I would definitely check this one out. "Just tell me exactly what you were doing conspiring with the Alice Monster."